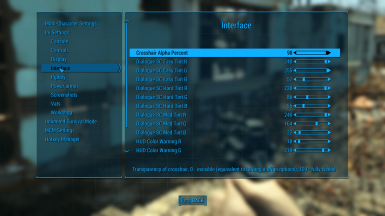 Adds an MCM menu that can contain ANY Fallout4 .ini settings. Fixed a crash when loading hotkey values for certain users in 1.02. Implemented profiles. Minor code improvements. Fixed a glitch with my split r*** settings in the main download. The console colors will now work. Ever been annoyed by how so many game options are not actually available ingame? 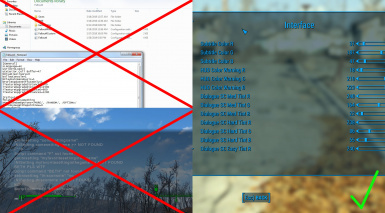 By how you have to open the .inis or use console commands to achieve very basic customisation such as changing power armor hud colors, changing fov, even several graphics options (blurs, dof, volumetric lighting) etc.? 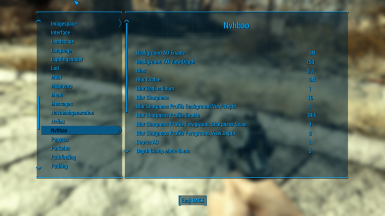 This mod allows for all that in a simple MCM menu ingame. Think I didn't include enough settings? Think I included too many? Know nothing about how to make an MCM menu? No problem, simply alter the settings.ini in the Data/MCM/Config, copy paste anything you want, delete anything you want. My mod will automatically re-create the ingame menu based on the settings.ini. Ever thought having only 1 .ini is not enough? Need different settings for various circumstances? Cycle through any number of .inis at the push of a button! This mod does not do anything special, merely uses the F4SE framework to tell the game to alter settings, kind of equivalent to you using the get/setinisetting console commands, but in a user-friendly menu. This means that settings the game engine will not allow you to change while it's running (such as resolution) will still have no effect. You may be wondering, since this is an options menu why have I only included a handful of settings in the main download? Why not include all of them? Why even bother letting people customize an options menu? Part of it is because of the above (I have not gone through every single setting to see what the game lets you change and what it doesn't) but also part of it is because having all 2.4k settings in an MCM menu makes it open ... quite slowly. 30+ seconds slowly. If you want to experience that for yourself, a MAX version is available. If you're sitting there thinking to yourself "k that's great and all, but I'd love it if I somehow was able to also have different settings for different characters like in an actual RPG", well, I have the answer for that too. 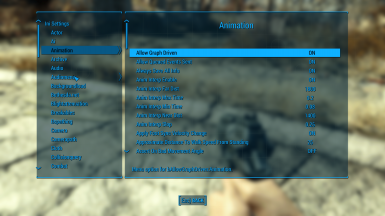 Check out my Multi-Character Settings mod.